The Great Lakes region is getting warmer faster than the rest of America, resulting in extreme weather patterns, rising lake levels, flooding and the influx of invasive species, according to a study released Thursday. Report: Great Lakes warming faster than rest of U.S. The level of dishonesty in this article is off-scale, but standard practice for climate scientists. 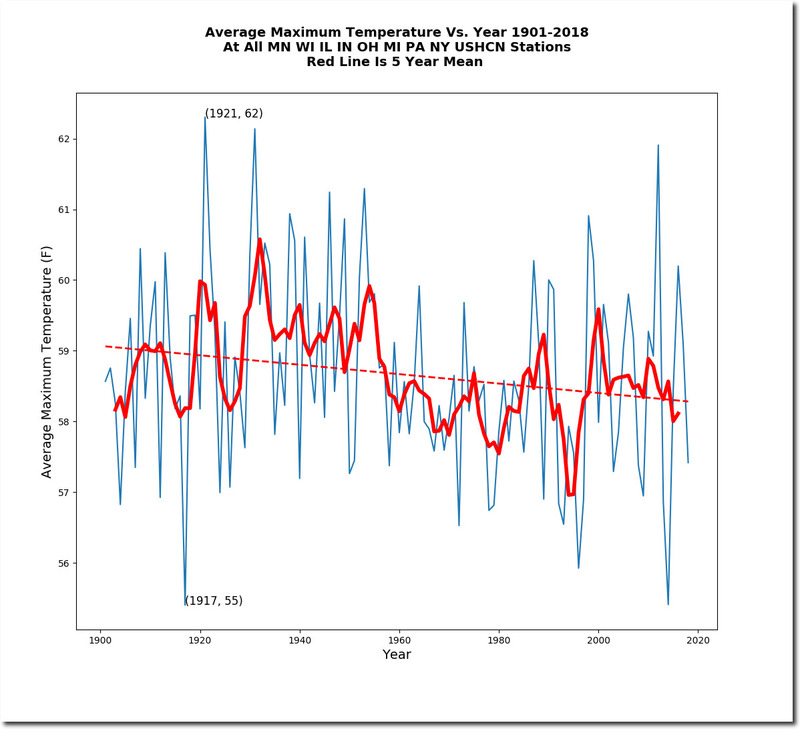 Temperatures in the Great Lakes States peaked in 1921, and have been declining ever since. 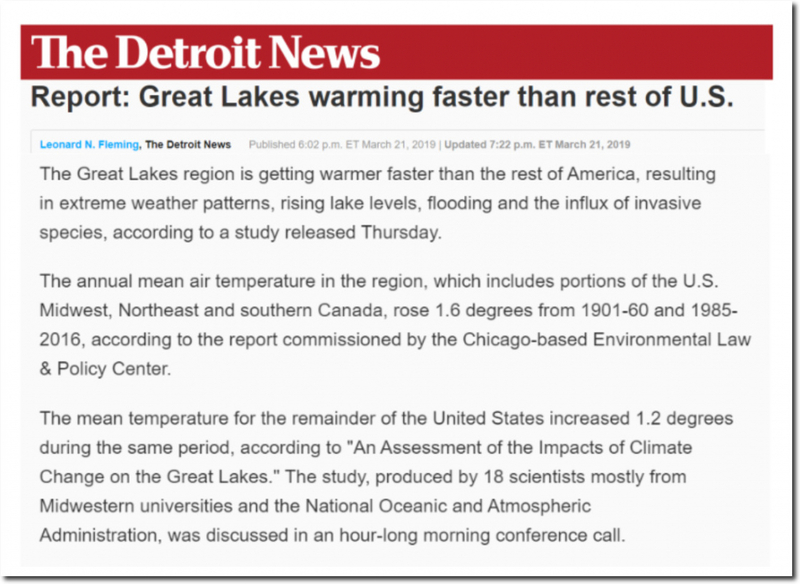 Five years ago, scientists were claiming that global warming was making Great Lakes water levels decline. Now they say global warming is making Great Lakes water levels increase. In 2013, the #2 Democrat in the Senate said that global warming was making the Great Lakes dry up. Ice levels on the Great Lakes have been above average for four out of the last six years. There is zero evidence that the Great Lakes are warming, or that climate scientists are capable of being honest about anything. These academics understand that they can say anything and not be challenged, and that the press will refuse to acknowledge anyone who speaks factually about the topic. I wonder, do they know what formed the Great Lakes? If you told them that it was climate change, their heads might explode. Gator: Well, if the Great Lakes are bad, then they know humans did it. Great Lakes Ice Coverage hit 81% in early March, well above the average 55% coverage. It was above average in 2018 as well. There is no sign that the Great Lakes area is warming. This year, the upper midwest has been well below average so far, achieving numerous record cold temperatures. 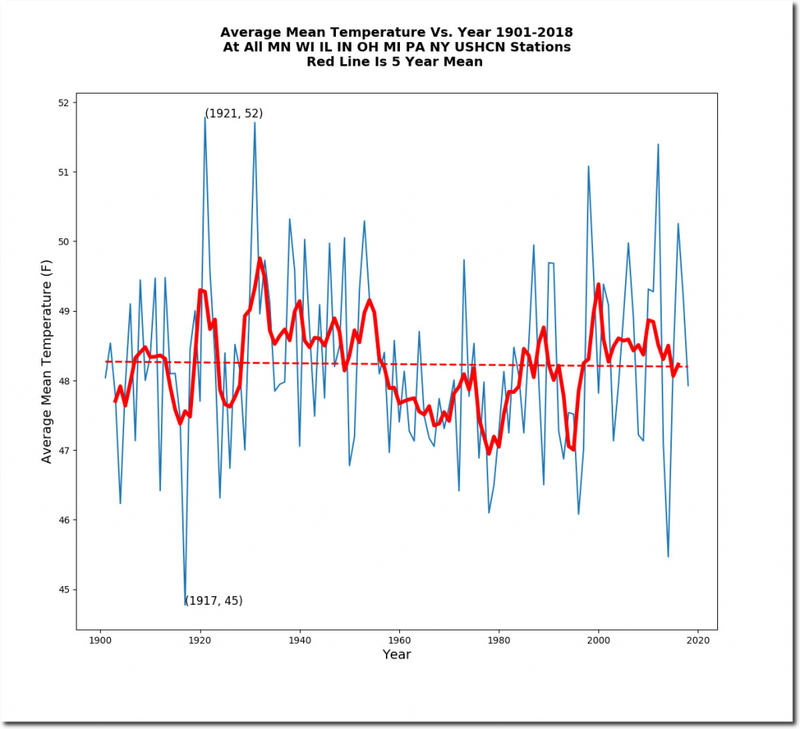 Of course, the study leaves out the cooling that took place in the 1960’s and 1970’s, and ends on a warm year – the 2016 El Nino year. Cherry-picking data is mandatory if you want to be a card carrying climate alarmist. Looks like another heat check for CliSci. As far as the press is concerned, they never miss! So AGW causes Great Lakes water level to increase, to decrease, which induces floods, droughts, and extreme hot and cold events. 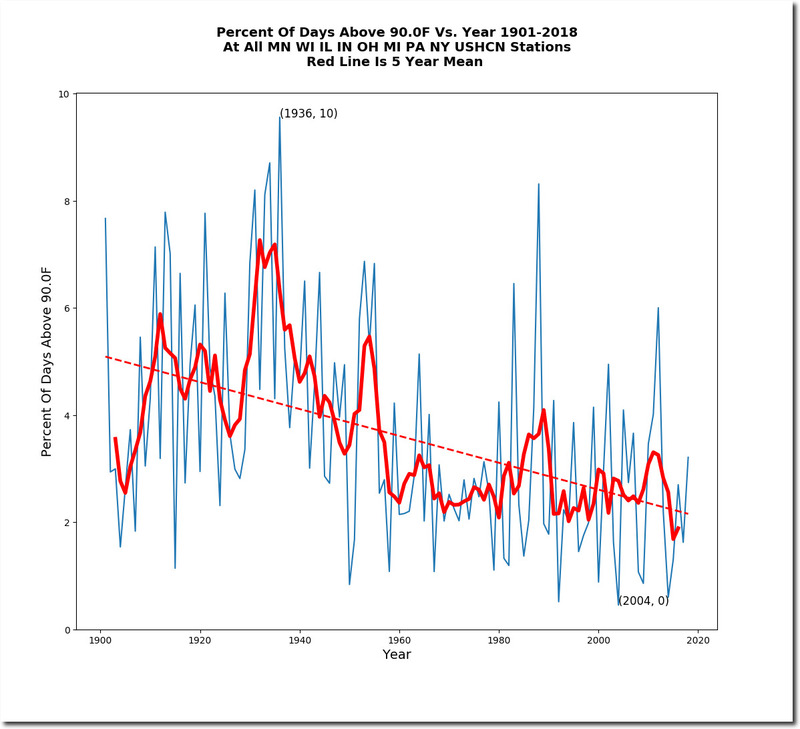 I wonder if those climate clowns are actual fraudsters (clearly, they try to fool readers) or merely a pathetic bunch of idiots. It is not stupidity-They are activly pushing an agenda . They(AAAS) sent Tony even a mail asking for “rapid,far reaching,unprecedent changes in ALL aspects of society” to save climate. are part(or would be result) of AOC’s new green deal and agenda 21/30. Destruction of democracy and possible resistence is also part of the show. – there is an agenda and those corrupted pseudo-scientists promote it. – they are actually pushing Malthusianism pseudo-science and its procession of genocidal “solutions”. …followed by a *mike drop*…BAM! Thank you Tony–very impressive. Totally shameless, incessant lies. Democracy dies when the “free press” knowingly refuses to publish the truth and deliberately publishes blatant political propaganda aimed at the dumbest of the dumb. Totally shameless, incessant lies! Democracy dies when the “free press” knowingly refuses to publish the truth and deliberately publishes blatant political propaganda aimed at the lowest common denominator. I pulled this chart and added the last 3 years (2017-2019), and the first 25 years (73-97) have an average of 62%, whereas the last 22 years (98-19) have an average of 45%. But even though that is the case, recent years have shown a tendency towards higher ice years. The trend is going back up, not staying or going lower. And here are the historic water levels of the various lakes (animation). Nothing out of the ordinary here. A few years ago it was drought caused by global warming. Made perfect sense, warmer makes water evaporate, the lakes were very low, and a summer drought was drying up some small trout streams to point a friend was trying to rescue fish and get them to the next remaining pond. The newspapers had articles about global warming. I put a trail cam by a water hole and caught all kinds of critters using it. That same spot has been underwater for about 4 years. Don’t these newspapers even look at their own past articles for a bare minimum of research? Great Lakes are doing fine. Don’t worry about the climate. Be happy. I’m a contract engineer and I’ve got tons of work right now. Working all weekend after working extended hours all week. Life is grand. Nat Geo predicted that climate change had doomed the Lakes level and ice over back in 2012. 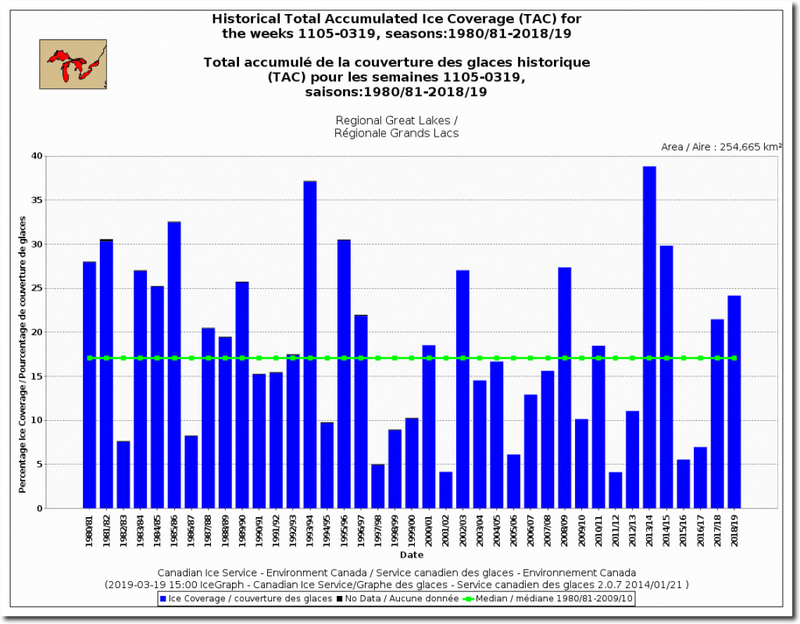 You have to admit…at record levels, record ice…it is pretty audacious to claim the Lakes are drying up and warming.